I imagine many of our fellow Houseblogs.net members are familiar with the blog Bungalowicious. For those of you who aren’t, much like Bungalow Insanity, it follows a Portland, Oregon couple’s adventures in remodeling a bungalow. We’ve been wanting to give Dawn credit for doing this, but it’s taken us a month to do it. (Sorry Dawn!) That should give you an idea of why we (at least speaking for myself) were not able to accomplish this ourselves! If you are curious about the history of our house, or the process of discovering it, keep reading. Hopefully Dawn doesn’t mind us plugging her! We were just so surprised and impressed by this! One of the first things Dawn discovered was that our house used to have a completely different address. Our current street address wasn’t assigned until the early 1930s. She also discovered that our house was built in 1910, not 1911, as we’d previously been told. By 1920, the house was inhabited by a new family: a widow named Nellie Earsley and her daughters Bessie, Anna and Ruth, sons Merit and Robert, and her mother, Christie Henry. By 1930, a newspaper advertiser named George Skiff was living here with his wife Mayme and their two adopted children, Duane and Phillip. The 1930 owner, George Skiff, did own the home and valued it at $4650. According to Dawn, we may be able to track down the builder if we can find an early permit. This is how she found the builder of her home. I first checked our your address on PortlandMaps.com. It had the historical oil tank permit from your house on the site. This was actually a really old 1927 oil tank permit (usually they are post 1950s) This permit shows an owner name “Mr. Imlay” who is someone to be researched. Because this permit was pre-1933, when Portland renumbered all the streets, it had the “old” address on it (with the new address added). This msg board explained the renumbering project pretty well. When Portland was originally numbered, there were about 4 blocks per 100 numbers, unlike today’s 1 block per 100. I was able to compare your PortlandMaps.com current house map with the Sanborn maps which are available online if you have a www.multcolib.com account. It does take a while to find the right volume number, but I’ve been able to scan through the index’s pretty fast once I know the old cross streets. If you go down to the Central Library, they have a Sanborn index based on todays addresses vs. the 1933 versions so they can find the volume faster and you can look at the real maps which are super cool (AND HUGE). They will bring up the volume you need from the basement upon request. Knowing the old cross streets helped me then look up old census records. I’ve refined this process so that I can do it quickly. and navigate to Portland, Oregon to search. You then put in the old cross streets. This gave me your 1930 enumeration district. 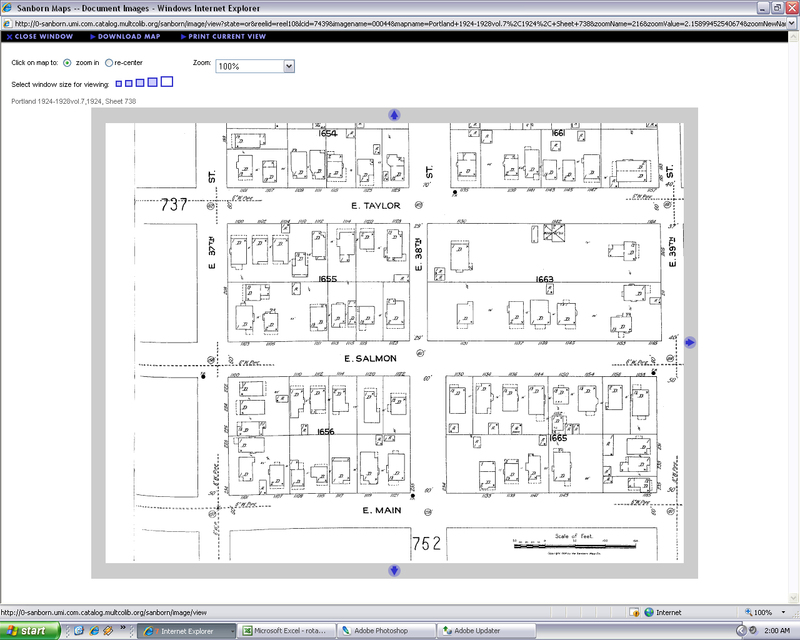 With that, I could then convert it to the 1910 and 1920 census enumeration districts (ED). That site also has a list of streets that have been renamed: http://www.stephenmorse.org/census/changes/PortlandChanges0.htm which is a cool reference. Now is the part where I needed to use my paid subscription to www.ancestry.com to actually search the census data. They give access to data back to 1790 up until 1930. By default you search census data by name, but I drilled down to the Portland, Oregon data directly and into the correct Enumeration district category (which is why I needed the enumeration district in the first place). If you have a name, usually you don’t have to go the ED route. 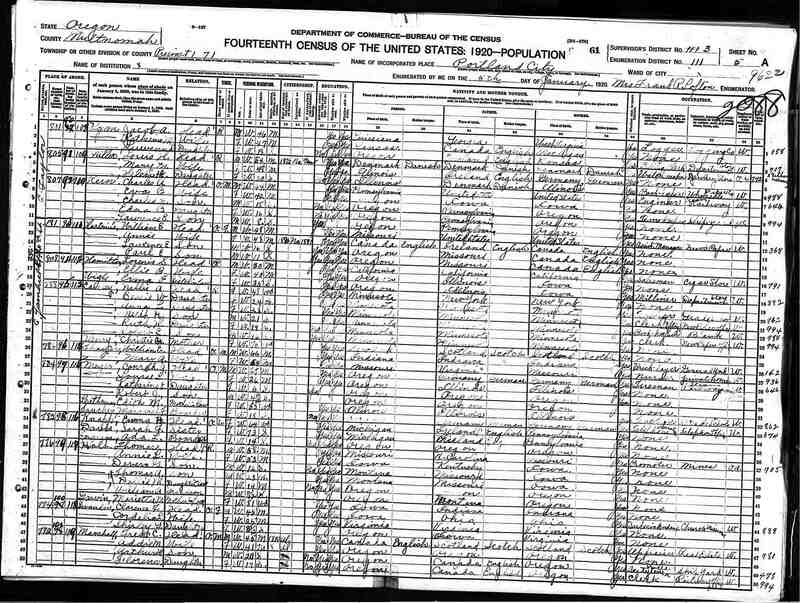 I then scrolled through the pages of your ED for the 1910, 1920 and 1930 census. 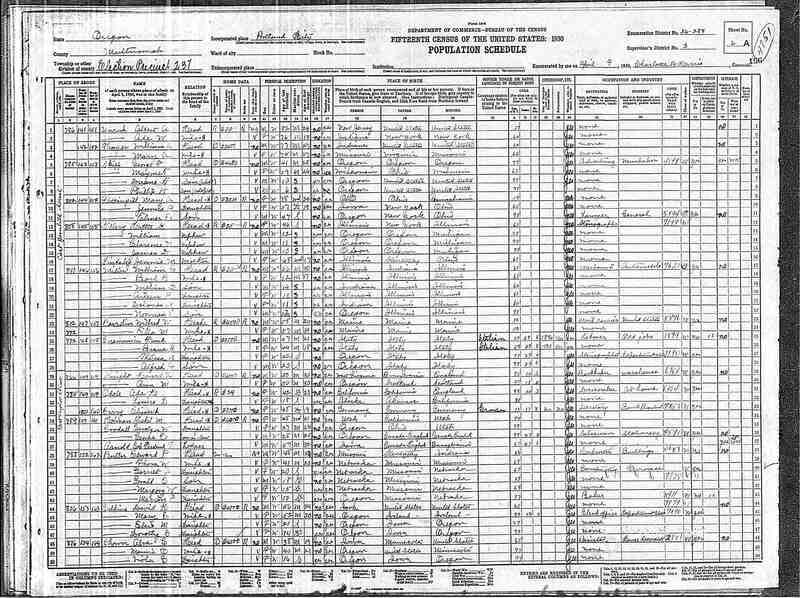 The right hand column is annotated by the census taker with the street name. I kept an eye out for E Yamhill entries as I went through page by page and found yours. One of the next steps to take would be to visit the Resource and Records counter at PSU aka Permit central. You’ve likely been there before I suppose. 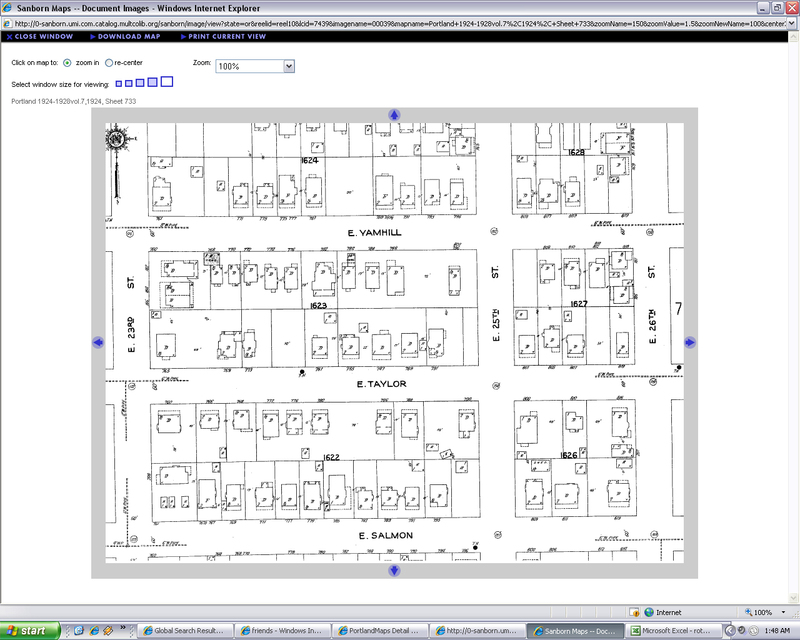 🙂 http://www.portlandonline.com/BDS/index.cfm?c=36663 You can request all the historical permits on file for your house. This is actually the first thing I ever did to start researching my house. They didn’t have the actual building permit (I believe many were lost in a fire) but they had the original plumbing permit from 1914, a sewer permit from 1920 and a garage permit from 1927. You could also visit the Central Library down town and use the name information I gave you as well as the names on the permits to look through the Portland City Directories they have there. These are quick reference and don’t require a request from the archives. Sometimes after work I stop down and look through them. They have nifty advertisements in them as well. This will validate spellings and occupancy dates. However you will lose the trail if there is an interim owner somewhere between 1910 and 1920 that would not be represented in the census or permit you have. What is nice is by going through volume by volume, you can get an idea of how long each family lived there and see where the gaps lie. You can also go down to Multnomah Building, Suite 125, Recording Office Public Research Room to start looking through Microfilm rolls for deed records based on what the census, permits and what the Portland City Directory gives you as occupants. Permits are actually likely the most accurate because they show the OWNER name, not the renter name (which the census data and directories may represent). Thanks Dawn – both for the information and research tutorial! Michael Ruhlman, co-author of The French Laundry cookbook (among others) bought an old house in Cleveland and went through a similar process of finding out who lived there when and how. It’s really an interesting thing to find out your house’s history. As an Architect whoâ€™s Masterâ€™s Thesis was on Architectural History and an avid genealogist who has also previously researched the â€œgenealogyâ€ of several homes and in one instance, the history of the builder, I could not pass up commenting on your â€œOur houseâ€™s genealogyâ€ posting. 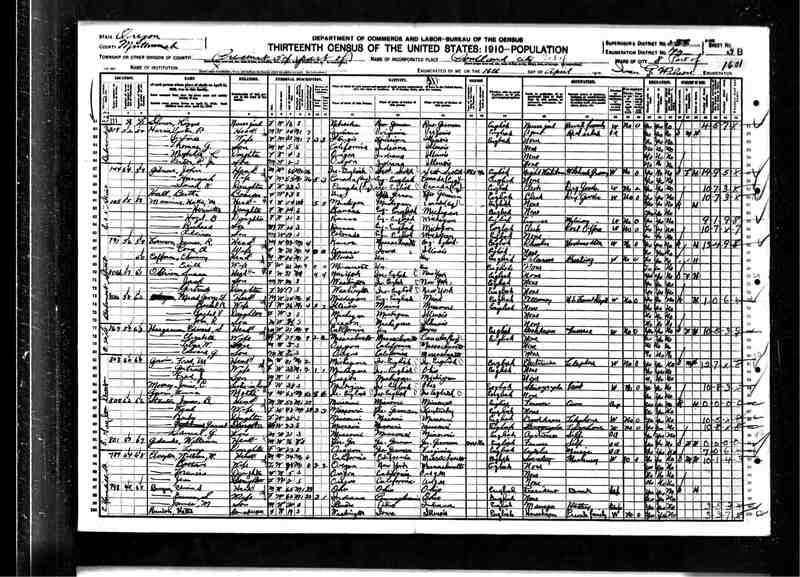 Based on Census enumerations before the 1910 Portland Census and Illinois State records, the occupant in your home in 1910 was Edwin S Burgan, b. April 1849, his wife Emma E Hefeley, b. August, 1849, m. November 16, 1876 in Vermilion County, Illinois. In 1880, Edwin and family are living in Danville, Vermilion County, Illinois, where Edwin is shown to be a Bookkeeper. In 1900, Edwin and family are found in Pullman, Washington, where he identified as a Merchant. In 1880 and 1900, Edwin and family also had a house servant. Edwin and family moved from Portland to Spokane where in 1915 he and his son, Jesse W. Burgan (not James as enumerated in 1910 Census) opened Burgan Furniture which operated until this last April when the company sold their building (originally built in 1920). I encourage you to follow the suggestion that you search the Portland Directoryâ€™s in the Central Library in your quest to further document your home. I wish you well and successful hunting. Dan – Thank you so much! I can’t tell you how much we appreciate you taking the time to add to our knowledge about this house. What is most fascinating to me about what you found is that Mr. Bungalow Insanity and I also moved to Washington State from Illinois and eventually settled here in Portland. Must be something about this house that appeals to former Midwesterners! Merit Earsley was my grandfather. Dawn – Thank you, with apologies to Hattie for overlooking her! Anne Marie – Wow! Does your family still live in the Pacific Nortwest? Pingback: Bungalow Insanity » Blog Archive » Supercalifragilisticexpi-Bungalowcious!